The most common frustration parents have helping their children do better at school is providing support for Mathematics. A recent survey showed that the number of private tutors employed by parents to help the children with Maths is more than the number of tutors for all of the other subjects put together. The free resources on this website may be the answer you are looking for. There are self marking exercises on all the basic school mathematics concepts along with puzzles, games and investigations all designed to support a child's learning. In a nutshell, it is probably fair to say, that the biggest obstacle to children learning more advanced concepts is a shaky grasp of the basics. You would be surprised the number of students who are inefficient at factorising algebraic expressions because they don't have a good enough knowledge of the multiplication tables. How can we expect students to apply geometrical theorems when they have forgotten the names and properties of basic shapes? Students would be much better realising if their answers to exam questions were reasonable if they lack the skills of estimation and don't have a common sense familiarity with common units of length, weight and capacity as modeled by common household objects. As a parent you can sign up for a 12 month subscription to Transum and use the resources to better support your child. This huge resource of three hundred and sixty six starters is also available to parents. The ‘Starter of the Day’ could be a great start to your family day at weekends and during holidays. In fact the whole family could work on them together. Each starter has answers lower down the webpage which you can access by creating an account and signing in to Transum Mathematics as a parent. We all know that regular exercise is required to maintain a healthy body. In a similar way the brain needs regular practice doing Mathematics in order to do well in the subject. 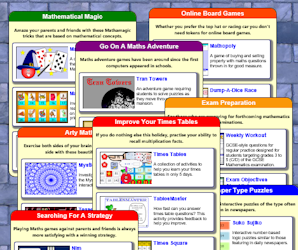 There are hundreds of online exercises here on the Transum website ranging from simple arithmetic to calculus. Parents can work on these exercises with their children knowing that they are self-marking so you can get immediate feedback as to whether the answer is correct or not. You may also like to have the peace of mind the answers will provide. These are available to parents who create an account and sign in to Transum Mathematics. Parents can support children develop order and structure in many aspects of home life but could also work together with their children on some of our activities that require an organised approach such as Ice Creams, Bus Stop and Logo. Transum has a ‘Learn a new times table in only 5 days’ page which links to activities we know work well in developing the skills, knowledge and understanding. As a parent you can ensure that the five day plan is followed and reinforce the child’s learning in this important area. The topic of geometry may have changed a little since you were at school but the basics are still there. Rather than there being a huge emphasis on learning theorems pupils nowadays approach this topic from a number of related themes such as Angles, Bearings, Construction, Mensuration, Shape, Tessellations and Transformations. Have a look at our Geometry links and you could try some activities yourself before working on them with your child. Statistics is the study of the collection, organisation, analysis, interpretation and presentation of data. It deals with all aspects of data, including the planning of data collection in terms of the design of surveys and experiments. It also includes describing mathematical relationships between variables and presenting these to an audience in a way that best conveys meaning. Often Probability is included in this topic. There is nothing like an exam to focus attention on the learning of Mathematics. At exam time of year both children and parents need a little extra support ensuring that everything goes as well as it can so what can parents do to support their children? Firstly providing a positive, ‘can do’ attitude is most important. It doesn’t help if the parent says that they hated Maths when they were at school. The resources to help are available now in a way they were not when parents were at school. Secondly providing a quiet place in the house for the child to revise is crucial, away from the temptations of the television and video games. That being said we also encourage the enjoyment of Mathematics in the family room working on topics through games, puzzles and investigations in preparation for the exam. In exams marks are still awarded for the ‘working out’ even if the answer is wrong. A large proportion of children are still not showing their method in a clear, ordered way and this is something parents can help reinforce. Parents are encouraged to use the activities here on Transum Mathematics to support their children in the learning of this fascinating subject. The resources are arranged conveniently by topic so that you can quickly find what you are looking for. We also have suggestions for using iPads (or other similar devices) and laptops. To see the answers and to get an advertisement free experience create an account and sign in to Transum Mathematics. One worthwhile activity a parent can do is play mathematical games with their children. Of course choosing the right game to suit your child’s ability is important but here are some of the more popular games to get you started: Fifteen, Tables Grab, Rounding Snap, TranTowers and Tran Tunnels. To provide motivation, excitement and continuity between sessions keep scores on this printable game score sheet. "You don't need to have special mathematical resources to help your child with mathematics. There are so many items in a normal house that can be used to help learn the subject. One example is a pack of normal playing cards. It's amazing how many mathematical activities come from a deck of shiny cards and there are ideas for all ages and abilities on the Playing Card Maths pages." You may want to consider employing a private tutor for your child. Individual instruction from a tutor can bridge the gap that sometimes exists between classroom teaching and a student's unique learning style. For those students who don’t like school, a great tutor can also find ways to engage them in mathematics and spark an interest in learning that might not have previously existed. They are also beneficial for special needs students, students preparing to take exams, and even students who just need a boost in their confidence. If you decide that you need a tutor finding the right one can be difficult. The availability often depends on where you live. For example, larger cities tend to have more available tutors than rural areas. Online tutoring services are a one possible solution to the availability problem. You can find out more about some of the major online tutoring services at Reviews.com. In some countries it is assumed that the school will be closed each year due to snow in the winter so the first few days of the summer holidays are reserved as make-up days. For everyone else days on which the school is closed means lost learning. To lessen the impact Transum has some quick and easy Snow Days Mathematics suggestions to keep you going. [For school holidays there are also School Holiday Activities].